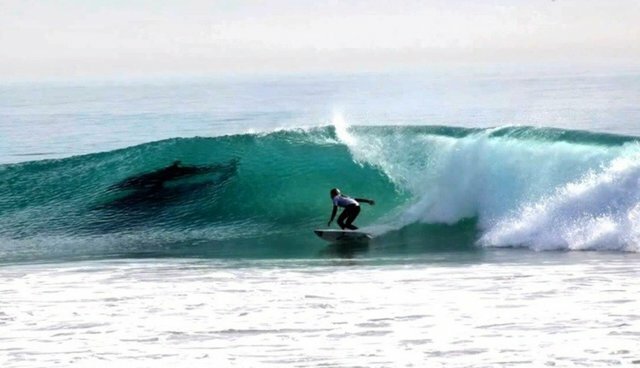 Competition was stiff for participants at the Rincon Surf Classic in Santa Barbara earlier this week, especially when a pod of about a dozen playful dolphins appeared among the waves, showing the pros and hundreds of gathered spectators just how it's done. Humans, of course, are merely visitors to that watery realm -- but dolphins in the wild have proven accepting, and sometimes even welcoming of our presence there. While surfing behavior has been observed in dolphins before, believed to be a source of amusement for them, this spontaneous display offers a nice reminder that the best dolphin shows are still those performed freely in the wild.